Okay, so I didn’t buy anything to workout at home, but Thursday evening I was inspired to try something new. 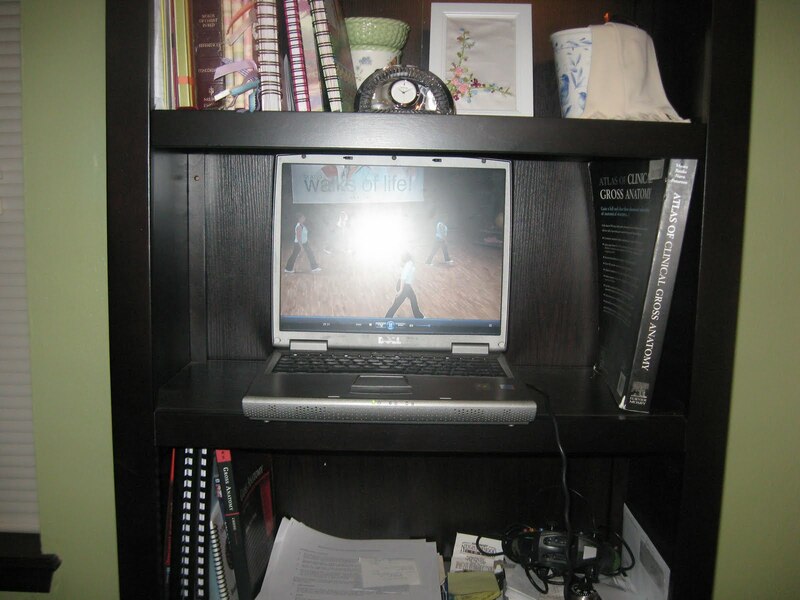 I took my husband’s old laptop and put it on a shelf in our bedroom and did a workout after dinner in our bedroom. This was nice because I was able to get some exercise in and not have to stop the family from using the nice, newer, large-screen Mac in the living room. Why didn’t I think of this sooner? I really enjoyed my workout in private and could’ve used this many more times in the past month that my mother-in-law has been here. I liked working out in the bedroom so much that I actually went and did a 30-minute workout this morning before breakfast while everyone was lazing around in the living room. I didn’t get a workout in yesterday, so I was real glad to have a private place to get one in today and not have to be up at the crack of dawn. p.s. It’s a good thing I worked out today because I gave in and ate a quarter pounder with cheese and fries for lunch!!! I thought about having a salad like earlier this week, but the burger sounded so good that I ate it. I had a light dinner later because I wasn’t very hungry, so I’m thinking that is good. I'm thinking that this is all good! Finding a private place to workout, eating a light dinner after a big lunch, and exercising while everyone else is lazing around!! I love it when I think of something so simple as moving the computer was for you, and it turns out to be really helpful. Isn't it funny how we can have good solutions like this all around, but we don't see them. Of course, now that you have your workouts will be all that much easier. Yay for you! Glad you were able to get a workout in. You got a workout in and you made a choice to be in moderation and not blow the whole day after McD's – you are doing great!